I identified and developed a visual language embodying Ludomatica’s primary constituent elements – Playfulness, Creativity, Collaboration, and Interaction. 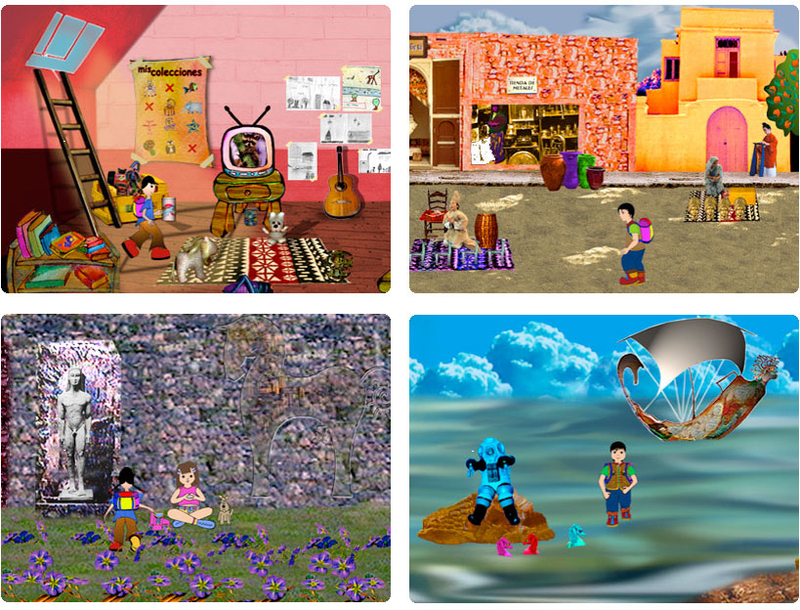 These conceptual guidelines were subsequently applied to the design of scenarios, animated characters, and interactions of 'La Ciudad Fantastica', an interactive educational game for 7- to 12-year olds. See: La Ciudad Fantastica Visual Design (Spanish), Technical Report for Colciencias - the Colombian equivalent of the US National Science Foundation. I researched cartoon animation techniques and applied these to the design of animated characters of La Ciudad Fantastica. The explorer boy and the explorer girl are examples of this process and represent the child-player in the game. See: La Ciudad Fantastica’s explorers character design (Spanish), Technical Report for Colciencias . I designed an expert evaluation tool for visual communicators (Spanish) to evaluate the visual and navigational aspects of La Ciudad Fantastica. LIDIE's psychology team administered this instrument to relevant survey participants. Escobar, G. (2000) How to Be Innovative Designing Educational and Interactive Environments for Children, World conference on Education Multimedia, Hypermedia and Telecommunications 2000 (1), 1814-1815. Gomez, G. (1999) Graphic Design for Interactive Learning Environments for Boys and Girls of the Ludomatica Project, Revista de Informatica Educativa, vol 12(2), November, Santafe de Bogota, 213 - 226 (Spanish).